Two-thirds of Mercury Rev sit in a room, alone expect for their current interviewer, one of many who’ll sit before them this afternoon, a pad of scribbled notes in one hand and a tape recorder in the other. They’ve a sizeable stock of pre-programmed answers and template responses, I’m sure; no-sweat retorts to questions about that breakthrough album, their singer’s sideline work as a former Flaming Lip… stuff like that. I rarely bother with notes when interviewing bands – it seems to make the experience so impersonal that little about the musicians in question is revealed – but today I’m not for taking chances. Answers to particular questions need to be revealed. I’m the consummate professional as of now. Outside, the summer sky’s greyed over miserably; guitarist Grasshopper, not-better-known-as Sean Mackowiak, stares blankly through the windowpane before him, eyes thin and body slouched. Drummer Jeff Mercel sips Coke while his bandmate swigs from a green lager bottle – Mercel’s eyes are brilliant bright and wide open, his posture welcoming, his tone friendly. It’s almost immediately obvious that, even so long after their well-documented personnel fall-outs and make-ups, Mercury Rev is still a musical beast born from wholly individual souls. Singer Jonathan Donahue is, sadly for DiS, absent; he had to return to the States on private family business following the band’s European shows of a few days’ prior to our rendezvous at V2 HQ. Luckily, the three-piece have no live commitments in the UK right now; indeed, they’ve little on the horizon at all, aside from the beginning of work on what will be their seventh studio album. The reason we’re here, though, has little to do with future plans; the present is Stillness Breathes, a double-disc set pitched as The Essential Mercury Rev. Whether or not you consider its disc full of b-sides and rarities to be essential is entirely dependent upon your present appreciation of the group, but what can’t be in doubt is that many of the songs that form the best-of half of the release – the Essential element – are certifiable classics. They are dream-pop perfection, from ‘Opus 40’ through ‘The Dark Is Rising’ and the timeless ‘Goddess On A Hiway; they are songs often imitated but never bettered, and alongside these comparatively recent Rev cuts are a handful of songs from the band’s days on Beggars Banquet. So, you’ve ‘Car Wash Hair’ arriving in your earphones directly after ‘Holes’. Nice. “We had to work pretty hard actually to get everyone around the same table, to get everyone to agree to it,” says Mercel of the band’s inclusion of material from their old days. “But I think it’s a better representation of the band than if it was just the last three records. Mercel says he’s still hopeful that a new Mercury Rev album will see the light of day before the end of 2007, but implies through uncertain language that it’ll actually arrive in 2008. Such a release date – early 2008 – would equal a three-year gap between studio records proper, as the band’s last, The Secret Migration, was released in January 2005. Their sixth album in all, The Secret Migration followed the massively-acclaimed pair of Deserter’s Songs (1998) and All Is Dream (2001); that it wasn’t so brilliantly received by critics didn’t particularly surprise the drummer. “It was a record we spent a lot of time over, and whether some people really loved it or didn’t like it, it’s another record. You go through cycles, and it was the same at the beginning – people who liked Yerself Is Steam (1991 debut) and Boces (1993), they didn’t like See You On The Other Side (1995). Now, though, a lot of people have gone back to that album. It’s a transitional record, I think. “It may just be that the timing wasn’t quite right for that music, and maybe people will come back and rediscover it in five or ten years or whatever. People have glossed over this one, for whatever reason. It’s easy to get tired of a band, if it’s being presented to you a certain way – you know, Deserter’s Songs had all these accolades, and All Is Dream was the same. It’s logical, almost, that at some point it’s going to come back down. It’s no knock against the English press, but it’s particularly apparent here that bands are built up only to be taken down a few pegs. It happens, and we expected it. The band’s first two albums – Yerself Is Steam and Boces – featured lead vocals from David Baker; his role was filled by Donahue come the recording of album number three, See You On The Other Side (the band’s last for Beggars Banquet). 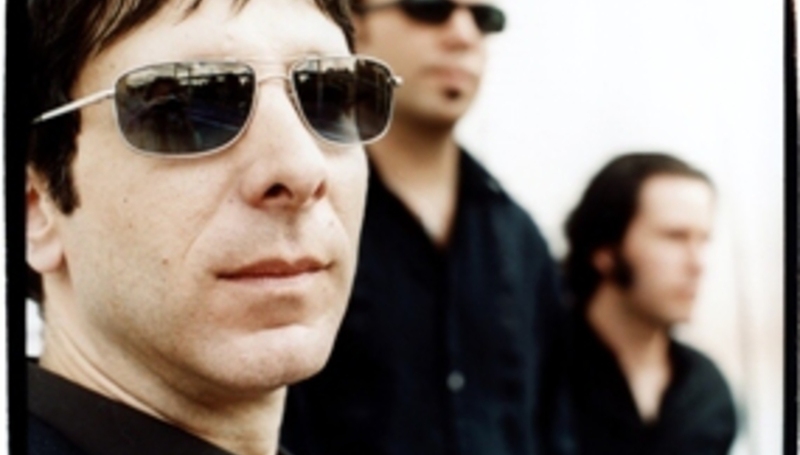 It’s only natural that the band concentrate on Deserter’s Songs and its follow-ups, though: the 1998 album was the one, the record that saw Mercury Rev break out of their cult rocker ghetto and into the blinding lights of the mainstream. NME awarded it their Album of the Year title, and it charted as high as 27 in the UK album charts (although their next two albums would trump that position, at 11 and 16 respectively). Mercel readily acknowledges the album’s impact upon the band’s career trajectory. “It’s good to dispel the myths about other countries and other cultures and other races, and go and see for yourself and form your own opinions. “It made a connection, and that was probably the most important thing. When people come up to you after a show, and they tell you this album had this affect on me, or some other personal story, it’s like, ‘My God, what we’re doing does matter to somebody’, and it wasn’t so much about now we can play bigger venues, or now we’re making tonnes of money… it’s really not like that. It’s really just about the personal side of it, and that’s continued. Stillness Breathes: The Essential Mercury Rev is released through V2 on October 2. Their contribution to the Back To Mine series, featuring a previously-unreleased Mercury Rev song, is released through DMC on October 23.